Berwick manager Robbie Horn was full of praise for his players after watching them beat second from top Stirling Albion at Shielfield on Saturday. “After conceding five goals at Elgin last week I was looking for a reaction from the players, and to a man I got it,” he said. “They were tremendous today and thoroughly deserved the victory. 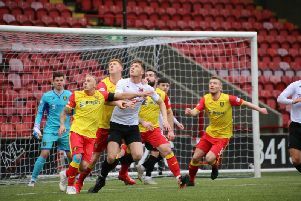 “Michael McKenna’s goal was a wonderful strike, it could have won any game, but any one of the players could have been the match winner, including goalkeeper Robby McCrorie, who made several first class saves. future ahead of him.” This was Stirling’s first away league defeat of the season – and afterwards man of the match McCrorie said: “I am loving my loan spell here from Rangers. “I honestly think I have learned more in this half season than I did in the previous two years playing development football.